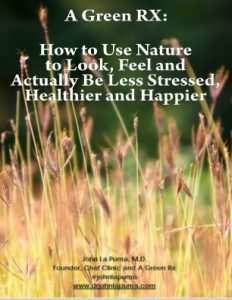 A New York Times best selling author twice with books translated into 8 languages and over a million copies sold, Dr. John La Puma writes books to inspire people to live better, look better and feel better…and his books show them how to do just that. Dr. La Puma’s most recent “(Men Don’t Diet, Men…) REFUEL” has helped tens of thousands of men, and the women that love them shed fat, boost testosterone naturally and pump up strength and stamina with the right foods, exercises, sleep tricks and productivity enhancers. His first general audience book, with Michael Roizen MD, was a New York Times best-seller: “The RealAge Diet: Make Yourself Younger with What You Eat” (HarperCollins, 2001); his first cookbook, also with Dr. Roizen, became an Amazon #1 Cookbook: “Cooking the RealAge Way: Turn Back Your Biological Clock” (HarperCollins, 2003). Dr. La Puma also developed recipes for Dr. Oz and Roizen’s Times #1 best-seller “YOU the Owner’s Manual”, and his ChefMD’s Big Book of Culinary Medicine also became a NYTimes, Wall Street Journal and USA Today best-seller shortly after release. Buy Now at Amazon.com or B&N.com. Or Read on a Kindle or iPad.